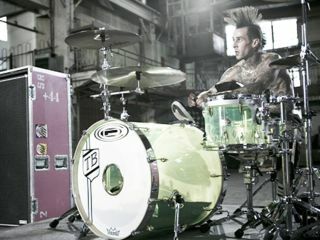 Travis Barker was critically injured in a Learjet crash in Columbia, South Carolina, early on Saturday morning (20 September) that killed four people. Along with the former Blink-182 drummer, his friend disc jockey DJ AM was also critically injured. The two had just played at a huge free outdoor concert in Columbia's Five Points district the night before. Federal Aviation Administration spokeswoman Kathleen Bergen says the plane carrying six people was departing shortly before midnight Friday when air traffic controllers reporting seeing sparks. She says the plane went off the runway and crashed on a nearby road. Bergen says the Lear 60 was headed to Van Nuys, California. She didn't have the names of those killed, but it is believed that they were the pilots and two passengers. Beth Frits, spokeswoman at the Joseph Still Burn Center, in Augusta, Georgia, said Travis Barker and DJ AM (real name Adam Goldstein) arrived at the hospital early Saturday. She said both men had "extensive burns." Update (21 September): According to Boston.com, Dr Fred Mullins of the Joseph Still Burn Center in Georgia confirmed Sunday (21 September) morning that Barker was burned on his torso and DJ AM was burned on his hands and part of his head. Both suffered second- and third-degree burns, and remain in critical but stable condition. He added that recovery from such burns can take up to one year but notes the men had no other injuries. Dr Mullins says he expects the pair to make full recoveries. More here.